Up to my chest in Virgin River water, I held my camera gear above my head, hoping that no deeper water would surprise me before I reached the bank. Though my heart was racing, I marveled at the extraordinary views of the Zion Narrows. 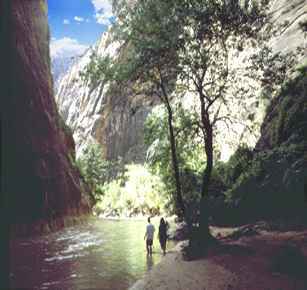 The spectacular gorge runs for l6 miles within southwest Utahs Zion National Park, 2,000 feet deep, and in places only 20-30 feet wide. Exploring within the shadows and light of its lofty walls, sandstone grottos, hanging gardens, and natural springs is an unforgettable wilderness adventure experience. Sixty percent of the hike is spent wading, walking, and sometimes swimming in the river. The current is generally swift, the water cold, and the rocks slippery. Flash flooding and hypothermia are constant dangers, requiring planning, proper equipment, and good judgment. I hiked the Zion Narrows in October during a two-week circular tour of southwest Utahs enchanting national parks, monuments, and state parks -- a zone of tangerine rock, red rivers, high deserts, low valleys, sheer cliffs, and pink-coral sand dunes. Lets travel the circle. One of Americas first national parks (l909), Zion is a 229 square mile showcase of unique natural beauty. Located l73 miles from Las Vegas and near two robust Utah cities, St. George and Cedar City, Zion is readily accessible via I15 to Hwy 9. 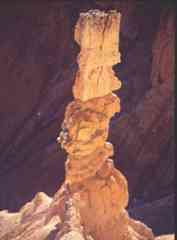 Summers are active with tourists, so the off-season months of October through May are a good time to visit Zions varied palette of formations with alluring names, such as Great White Throne, Temple of Sinawava, Altar of Sacrifice, West Temple, Watchman, Mountain of Mystery, and South Guardian Angle. My journey up the Zion Narrows started at the Temple of Sinawava and left me speechless. Near Orderville Canyon, two hours upstream from the end of the paved trail, I happened across two rock climbers dangling precariously l000 feet above my view human spiders scaling the burnished rock face. I left my business card at their obvious return spot, indicating that I had photographed them. A month later I received a letter of interest explaining they were the first to climb this wall and the world climbing community was excited about the feat. Utah elk An easier Zion walk is the mile-long Canyon Overlook Trail, affording great views of Pine Creek and Lower Zion Canyon. It is a fascinating botany zone of single-leaf pinon, scrub oak, iceberry elder, juniper, giant helleborine orchids, lichens, beavertail prickly pear, narrow leaf yucca, and silver bush. Critters you might see include Western whiptail lizards, canyon wren, ringtail cat, elk, mule deer, sapsucker woodpeckers and porcupine. For more solitary day hikes in Zion, drive to the East Rim and check out Checkerboard Mesa. Along the way, Clear Creek Overlook is a worthy venture. Hoodoos are readily seen on the east side. One observer noted: "These hoodoos are weird, iron-capped rocks resembling enormous mushrooms, or king-sized toadstools...a singular display of natures art mingled with nonsense." Leaving Zion, take highway 9 to highway l7, then Interstate l5 to Cedar City. Cedar City is a clean, lively city worthy of a nights stay. The highly acclaimed Utah Shakespeare Festival is held here annually, June through September. Cedar City serves as a gateway to Cedar Breaks National Monument and the ghost towns of Silver Reef, Old Frisco and Grafton. Brian Head Ski Resort is 32 miles away. For six months of the year, you can ski Brian Head in the morning and play an afternoon round of golf in Cedar City or St. George. St. George is ranked among the best places in America to retire with its eight golf courses, community symphony, major medical center, and commuter airport. The 24-mile drive from Cedar City to Cedar Breaks along highway l4 and l48 is beautiful, eventually climbing to nearly l0,000 feet altitude. The Cedar Breaks amphitheater is a huge coliseum shape, 2,000 feet deep and three miles in diameter. It is a visual feast of stone spires, columns, arches, and canyons of intricate design. Weather sculpting and varying combinations of iron and manganese give the rock its red, yellow, and purple color. 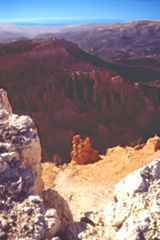 Native Americans referred to the Cedar Breaks amphitheater as The Circle of Painted Cliffs. "Breaks" is another term for badlands. Early Utah settlers misnamed it, mistaking the abundant junipers for cedars. 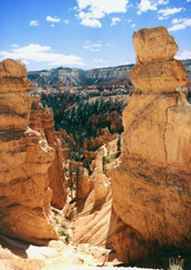 Cedar Breaks is less visited than the more popular Zion and Bryce Canyon National Parks, thereby offering more elbowroom and space for hiking excursions. As one observer noted, "If Cedar Breaks were anywhere but in this region, it would be picked as one of the worlds greatest scenic wonders." In the colder months, some roads may become closed. Cross-country skiing and snowmobiling are allowed in the monument. Exiting Cedar Breaks, take either highways l4 or l43, traveling east to U.S. Highway 89, connecting to highway 12 for a journey to regal Bryce Canyon National Park. The Paiute tribe called Bryce the place where "red rocks stand like men in a bowl-shaped canyon." Bryce is actually a series of breaks in l2 enormous amphitheaters plunging 2,000 feet through nearly 60 different layers of pink and white limestone. Bryce is a great location for photography, painting and day hikes. Slow film, a steady tripod, small lens apertures, and a polarizing filter are recommended for shutterbugs. 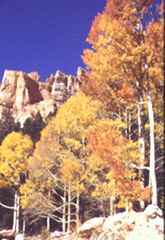 Bryce Canyon is one of the first places in Utah for those who love to catch trees changing from spring green to falls brilliance. My favorite trail is the half-mile Bristlecone Camp Trail, a walk among oaks, aspens, and ancient bristlecone pines. A scenic drive along the 18-mile main road affords outstanding views. On clear, brilliant winter days 100-mile views from Rainbow and Yovimpa points are only restricted to the curvature of the earth. The park has 50 miles of hiking trails, 400 plant species, l60 bird species, and active populations of deer, pronghorn antelope, elk, mountain lion, and mule deer. Horseback rentals and trails rides are also available here. Bryces rim is a zone of pine, spruce, fir and aspen typical at 8,000-foot in elevation. When descending from the rim to lower elevations, one finds an entrancing, lacy fretwork of thousands of intricately eroded, multicolored minarets, spires and pinnacles. 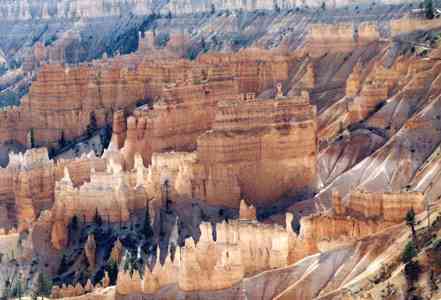 A l9th century government surveyor called Bryce Canyon "The wildest, most wonderful scene the eye of man ever beheld." Non-campers should make arrangements to stay at Bryce Canyon Lodge, a 1920s stone and timber structure designed by master architect Gilbert Stanley Underwood (open April through November). Coral Pink Sands wildflowers To complete the adventure circle, exit Bryce and travel west to highway 89, south. 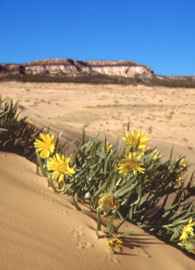 En route to Kanab, take the l2-mile paved side road to Coral Pink Sand Dunes State Park. There is a 22-unit deluxe campground here on a first-come, first-serve basis. Its best to arrive mid-week, as all-terrain vehicles have access to some of the terrain on weekends. Pink Coral is a seldom-visited desert gem. The dunes color is unlike any Ive ever encountered. The extensive dunes are contrasted by deep blue skies, juniper and pinon pine, steep red cliffs and outcroppings, and stunning wildflowers that reach their peak in early summer (though I found some still blooming in October). The sand comes from eroding Navajo sandstone. This unique zone is great for hiking, photography, or just becoming a l0 year-old again, playing carefree in the sand. I was able to roll naked down the dunes (knowing that I had a good portable shower back in camp). Exiting Pink Coral, drive back to highway 89 and continue l7 miles to Kanab, located along the Arizona border. Kanab is a great place to splurge and unwind after the park and monument adventures. I stayed at the relaxing Shilo Inn with a room beside the hot tub where I was able to soak and view the World Series on my room television. Kanab is called "Utahs Little Hollywood." Hollywood movie settings dating from Tom Mix Deadwood Coach (1924) to Thelma and Louise (1991). A partial list of other famous movies filmed here includes Stagecoach, Gunsmoke, The Greatest Story Ever Told, Planet of the Apes, Mackennas Gold, Outlaw Josie Wales, and Grizzly Adams. A tour of the major movie locations is available. Kanab has an historic old town, fine dining and lodging, a frontier movie Town set and a variety of western gift shops. Its is a great central location for daily excursions: the highly recommended Grand Canyon North Rim, 79 miles; Glen Canyon Dam, 67 miles; Zion, 31 miles; Angel Canyon, 40 miles, the magical underground lake and hidden home of the ancient Anasazi tribe; and Lake Powell, 60 miles, Americas largest man-made lake. Click here for details to plan your own trip to southwest Utah.